Be the first to read the 2017 top digital trend predictions for the the power and utility industry, and gain a competitive edge by understanding what’s next. 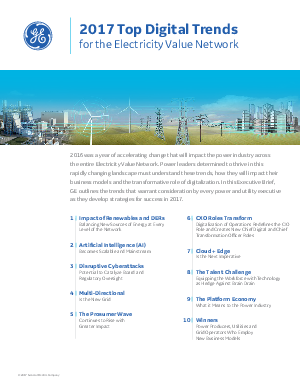 Across the Electricity Value Network (EVN) - from generation through T&D and end user management, first movers and proactive digital adopters are far more likely to thrive in the future. Don’t be left behind. Get the full 10 trends in this exclusive Executive Brief from GE designed to help you set your strategy in 2017 and beyond for greatest business opportunity.